So I’ve been lugging around a heavy 300mm f2.8 lens with me in addition to my 500mm f4 that I can’t seem to leave in the car. And sometimes I’ll toss in a wide angle or a 70-200. Eventually I decided that when carrying around so much gear, and/or on long hikes, I might be better off carrying a slower version of the 300. 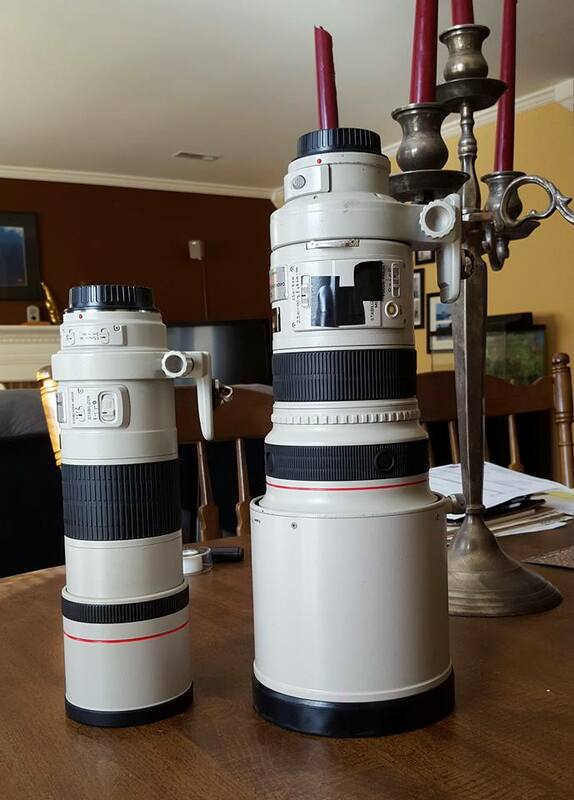 So I picked up a Canon 300mm/f4 in the used department and have been carrying it in lieu of its big brother. As a test, I decided to do a side-by-side, real world test to see how they stacked up against one another. In the weight category, the f4 version definitely wins. It is very light, weighing in at 2.6 pounds as compared to the 5.18 of the f2.8 version. It’s also quite a bit smaller at 8.7″ long by 3.5″ in diameter versus 9.8″ and 5.0″ and this doesn’t include the lens hoods. For the image quality test, I shot multiple frames of several scenes with the two lenses on a Canon 7D MkII body with both lenses at their widest apertures. I chose the best image from each, among the groups of many, and processed them identically. Comparison between f4 and f2.8 versions of Canon’s 300mm prime lenses. Click for larger image. It doesn’t take a whole lot of inspection to see the differences between the two images. The f2.8 version is sharper, has more contrast, and shows more detail. So yes, big glass is better…optically. But is it worth the extra weight? For me, that’s gonna depend on my energy level and how much gear I’m willing to carry. I’ll still grab for the dependable f2.8 first but the f4 will make for a nice companion in some situations.